I was in Toyko, my first and only trip to Asia, when Katrina hit, and rather than wander that exotic place I spent many hours in the hotel room, watching CNN and monitoring Web sites, rapt and horrified like everyone else. The hurricane was awful enough, but the aftermath was shattering — the incompetent response, the rapidly deteriorating conditions at the Superdome, the people dying in wheelchairs. Bush looking out the window of Air Force One, a politically fatal fly-over. There were those rumors (untrue) of roving gangs of rapists, as ugly racial fears surfaced. We all saw poverty and desperation like we hadn’t seen before. This can’t be America, is what a lot of people thought. There are many types of racism, including the type that says there’s no racism in America anymore, and the situation would be precisely the same if the victims all looked like Macauley Culkin. Then there’s institutional racism: We have to ask whether the government would have been better prepared for this sort of situation in New Orleans if the most vulnerable communities hadn’t been, for the most part, black neighborhoods. (Like, were the levees considered good enough for “the black part of town?”) [The Chicago Tribune ran a graphic showing elevation and demographics in New Orleans; to a striking degree the areas below sea level are predominantly African American.] This will likely wind up in congressional hearings — full-blown postmortems, with testimony from folks high and low, the rescuers and the not-quickly-rescued, that will be far more dramatic than the Supreme Court confirmation hearings (now plural). In Japan, at the Memorial Hall for the Great Kanto Earthquake of 1923, there is a separate monument to the Koreans who were killed because of rumors that they had caused the quake and were poisoning the water supply. There was no truth to it, of course. But in times of crisis, people turn on minorities. It will be interesting to see if some of the early news reports about gangs of armed thugs, about people shooting on rescue helicopters, hold up. Rumors are thick in a whirlwind. I’ve been to New Orleans a few times this summer, and it still shows the effects of the Big One. At least that’s my impression, for what it’s worth. Bourbon Street is as rowdy as ever (the destiny of all iconic American locales is to become parodies of themselves), and the Garden District has charm to burn, but I still had the sense of a place damaged not just by water but by an exodus of people and capital. Of course, America is a very corrupt country with a dirty history of oppression, injustice and slavery. While America likes to lecture Ghana about corruption, every African knows all about Halliburton’s no-bid contracts and their connections to your vice president. When our conversation ended, I walked away with many thoughts spinning in my head. I remembered how outside the United States, people are often more aware of other countries, cultures, history and news than Americans. Perhaps this is a reflection of America’s educational system, America’s embedded self-perception of exceptionalism or merely a negative side-effect of America being so powerful. I remembered the launching of the 2003 Iraq invasion and how pathetic Colin Powell appeared trying to defend the upcoming invasion with “evidence of weapons of mass destruction” that wouldn’t convince most schoolchildren, let alone the rest of the world. I remembered the feelings of helplessness as the American government insisted on waging a war, with virtually no debate or discussion in Congress or in the media, while public protests were actively suppressed. Finally, I remembered my grandfather’s collection of newspaper cover pages. His favorite was the 1969 moon landing as he insisted that the manned moon landing was the greatest event in all of history, not merely U.S. history. Mankind, he argued, had been staring at the moon throughout history, and America will always be known as the first country to place a human there. This still “minor” Hurricane Katrina struck Florida at 7 p.m. All responders were prepared yet there were still nine Floridians dead almost immediately. The next day would be worse. August 26, 2005: As we expected from our exercise involving Hurricane Pam, Hurricane Katrina’s wind speed momentarily dropped to 75 miles an hour by 9 a.m. The change was not as encouraging as it might seem. It was like a long-distance runner slowing briefly around the curve before increasing speed for an all out race to the finish, in this case Louisiana. And as our experts predicted, eight hours later, the storm had regained its momentum and become Category 2. Hurricane Katrina was now ripping along the gulf at 100 miles per hour. Hurricane Katrina swept through Florida, traveled along the Gulf Coast, and continued picking up speed. Unless it shifted direction, it would strike New Orleans with a minimum speed of 115 miles per hour—Category 3. The mayor knew this. The governor knew this. The city’s first responders, along with first responders in those nearby communities that maintained mutual assistance pacts, all knew this. That was why we expected the same call for assistance Jeb Bush had made. That was why we also expected a mandatory evacuation order within New Orleans. Instead I felt we were confronted with denial, delay, and poor choices. 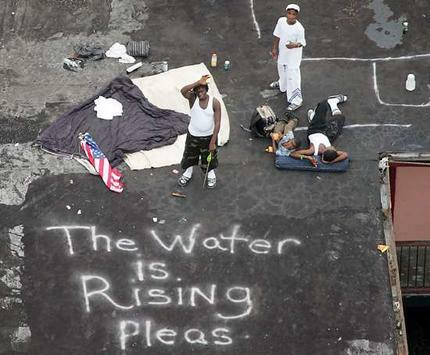 With the fifth anniversary of Hurricane Katrina approaching, a central figure in the botched response, then-FEMA administrator Michael Brown, says the Bush administration made a “fatal mistake” in churning out facts and figures about its efforts instead of explaining the wider picture and the obstacles the government faced in dealing with the catastrophe. Ten days later Brown, who had little experience in dealing with natural disasters, was out as FEMA chief. He now criticizes his boss at the time, then-Homeland Security Secretary Michael Chertoff, for his handling of the situation. Chertoff was an avian flue conference during part of the unfolding catastrophe. “Whether it’s a natural disaster or man-made disaster, you need to have one person in charge. And that person needs to be on the ground with the team, understanding what’s going on,” Brown said. I do recommend Spike Lee’s two-part HBO documentary, which touches on this. 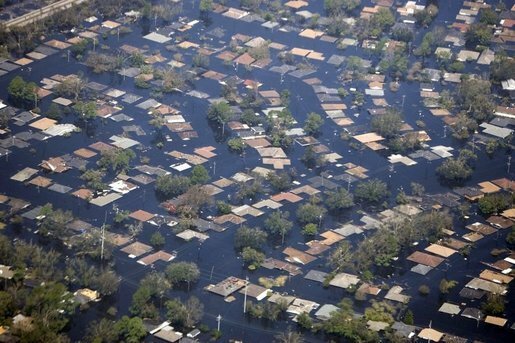 There, you see public housing projects in New Orleans torn down despite having no flood damage. You see Charity Hospital, one of the largest in the country and servicing the poor, unopened, while a new sprawling medical campus that would cater to a higher-class clientele gets planned. You see the racial and ethnic makeup of the population, and particularly the socioeconomic makeup, change. And you see a Republican Governor in Mississippi get much more attention and funding at the outset of the recovery, with the Bush Administration in office, than a Democratic Governor in Louisiana. That said, there are bright spots, particularly Brad Pitt’s home-building project. But the disparities exist, as they have always existed. And, the money was available to reduce those disparities. More than a quarter of the $20 billion in Housing and Urban Development relief funds that were earmarked for Gulf Coast states after Hurricane Katrina remains unspent five years after the storm, a fact noticed by at least one congressional leader who’s eager to spend it elsewhere. I think you can call the recovery in New Orleans and the Gulf Coast uneven and unfinished. And driven, as ever, by money. Since we are now five years beyond the hurricane, let me tell you what the true disasters of Katrina were, and these are the things that the media will likely intentionally miss in their anniversary analysis. Some of us spotted these at the time, but now that the media now has the advantage of hindsight (which is supposed to be 20/20) so they only way they get it wrong now is if they want to get it wrong. 1) Government cannot save us. The American left and its media believes that it is government’s job to save us all. I don’t care whether we’re talking about local, state or national government—it rarely has the power to save us. 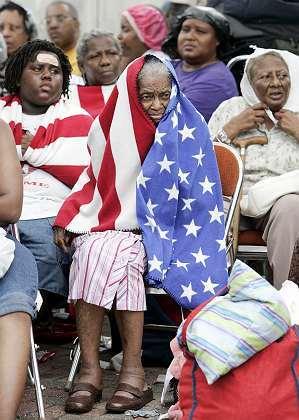 This is the most devastating fallout from Katrina, the fact that people think government is there to save us. The message was loud and clear from the media—“it is government’s job to save us.” Yes, I think Mayor Ray Nagin should’ve used the buses to save his people, but he didn’t. Yes, I think Governor Kathleen Blanco should’ve called in the National Guard sooner, but she didn’t, and yes, I wish Bush would’ve responded faster with the recovery days after the Coast Guard was called in to pick people off their roofs, but he didn’t. Wait for government to save you, and you may never be saved. 2) Failure of the Welfare State. Three generations of Democrat promises to the people of New Orleans were exposed when the levees broke. Democrat “leaders” in New Orleans had promised these good people that they would care for them from cradle to grave, just vote Democrat when you are bused to the polling places (the buses worked fine on Election Day.) The Democrat Welfare State was exposed on those rooftops that day. It took at least 70 years to falsely teach those Americans that government would save them (see #1.) When they needed government most, it was not there for them. Imagine that? The media missed the real story behind those on the rooftops. Why were they still there? They were waiting for government to save them as promised. 3) Failure of the media to be accurate. The media got as many stories wrong with Katrina as it got right. The headlines of the day shouted “Tens of Thousands Dead, Thousands Dead in the Superdome, Superdome Destroyed, Toxic Soup Floods New Orleans, Bush Hates Black People” (Oh, that was Kanye West, but the media helped him spread that message.) The tragedy is that more than 1,800 people died, 1,400 of those in New Orleans. Of those who died in New Orleans the large majority died because the levees (promised to be secure by all levels of government—see #1) broke. Had the money dedicated to the levees been spent where it was intended, they would’ve held and perhaps the number dead would’ve been in the dozens, not the hundreds. It was the levees’ breaking that caused the major damage, not the hurricane itself—the media seemed to blow by that fact in 2005.